Uber has a new CEO, and “he just might be the anti–Travis Kalanick,” said April Glaser in Slate.com. The ride-hailing juggernaut’s board this week tapped Expedia CEO Dara Khosrowshahi to succeed the ousted Kalanick, ending a contentious, months-long search. 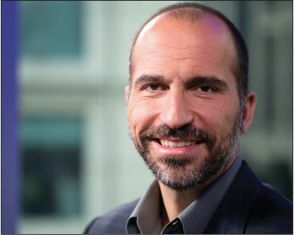 Like Kalanick, the 48-year-old Khosrowshahi has been wildly successful in Silicon Valley, building Expedia into “one of the most powerful online transportation empires in the world.” But unlike Kalanick, whose win-at-all-costs management style helped incubate a toxic corporate culture, Khosrowshahi has made Expedia an example for the rest of the tech industry. In a heavily male field, Expedia’s workforce is 50 percent female, including 25 percent of its technical staff. And Fortune named Expedia one of the best places to work this year. “In Khosrowshahi, Uber has selected a CEO who is both a logical successor to Kalanick and a reaction to his most obvious shortcomings,” said Derek Thompson in TheAtlantic.com. Uber and Expedia are both in the business of connecting consumers with service providers. Switching from hotels and airfare to on-demand rides shouldn’t be a huge leap for Khosrowshahi, who has quadrupled Expedia’s revenue since becoming CEO in 2005. But where Kalanick was regarded “as a prototypical tech bro,” Khosrowshahi is seen as “an amiable leader” with a “calm, no-drama approach to business.” Their approach to politics is different, too: the Iranian-born Khosrowshahi, who fled that country’s revolution as a child, has been an outspoken critic of President Trump.